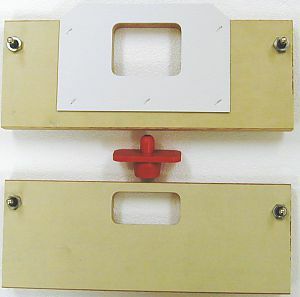 The Templaco Latch Face and Strike Plate Template Kit includes latch template, strike template and center locator. Latch size: 1" (25mm) x 2-1/4" (57mm). Full-lip Strike size: 1" (25mm) x 2-1/4" (57mm). Using your router this two template kit will produce the finish mortise on both the door and the jamb. The strike template is for a ”full lip” style strike which is 2-1/4” tall and is mortised completely through the edge of the jamb so it creates a three sided mortise. The door edge template finish size is 1” x 2-1/4”. Both templates are attached to the door and the jamb using the built in nail assemblies. Supplied with one Red Plastic Center Locator as shown to locate the templates onto the door and jamb in the proper position.